Example of wire overlay with skin and subsurf modifiers. The “Wire” option in object draw properties now works in Edit Mode. A light wireframe is blended over solid mode when enabled. 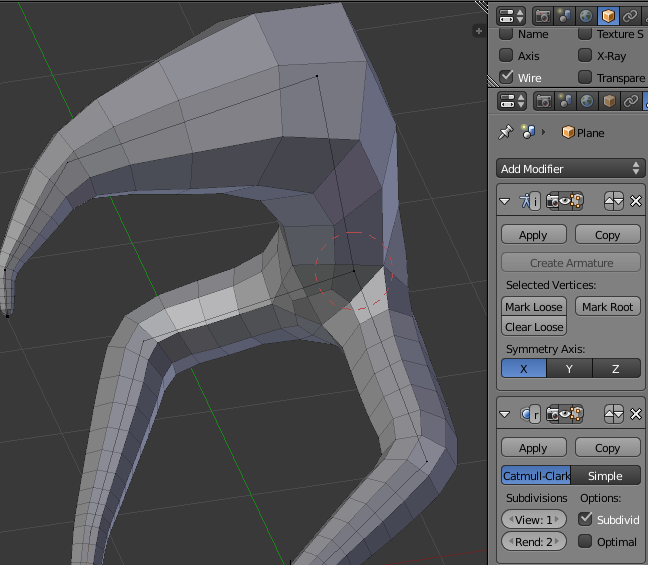 Generating armature now takes object transformation into account. THANKS NICHOLAS YOU’RE THE BEST I’M GOING TO HAVE FUN…. This Modifier becomes better and better, great Work. Is there a short video or description on how to use this modifier? I just want to make sure I’m using it correctly. It looks different from the first short video made a few months back… cheers. In theory, there’s some really good documentation on the wiki… but unfortunately in reality I haven’t written it yet. It should be pretty easy to figure out the basics of the modifier, but there are enough flaws as it currently stands that any documentation I write right now will have a lot of caveats about potential pitfalls and how to work around them. So for now prefer to keep working on the modifier and see if some of those issues can be negated.